I do like a good BB Cream at the moment, usually I put them under my foundation but on a good skin day or when the weather's very hot like it has been recently I'll wear them on their own or with a bit of concealer. I've tried BB Creams from lots of different brands, some are just tinted moisturisers that provide coverage while others have skincare benefits to improve skin health, but Clarins' offering seems to have it all. Or does it? 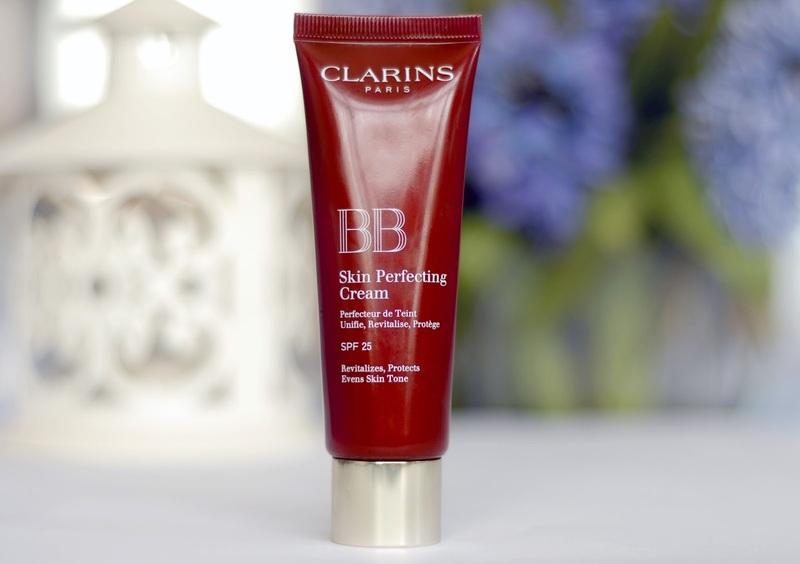 The Clarins BB Skin Perfecting Cream* boasts a 3-in-1 skincare and beauty formula- 3D radiance pigments to even the skintone and cover blemishes, Katafray, Kiwi extract and Hyaluronic Acid to improve vitality and hydration, and 100% mineral SPF25 sunscreen with Tocopherol to fight free radicals. The cream is advertised to revitalise, protect and perfect for 'an easy way to get beautiful skin' which seems fair seeing as it retails at £28! One of the things that I initially thought was particularly good about this product is that Clarins offers it in three shades- light, medium and dark. Looking at the product page on the Clarins website you'd think that the '01 light' would be the perfect colour for fair skins, I would even say that swatch ventures into pale, but once receiving and swatching the product myself I found that to be very far from the truth. The Skin Perfecting Cream is presented stylishly in a dark red tube with gold top that reflects its high price point. The cream smells quite pleasant and feels like a thick moisturiser on the skin but thins as it's blended and dries to a velvety feeling finish that looks matte in the shadows but catches the light. Unfortunately the two things that I really couldn't get on with with this product are the colour and the coverage. In my opinion this definitely isn't light- it's far too dark for me, a colour I would never naturally turn and one that would need about four applications of fake tan in a row before I was even close. Do brace yourself for the photos below because neither are very flattering but they do give a better impression of what I'm talking about than just an arm swatch. 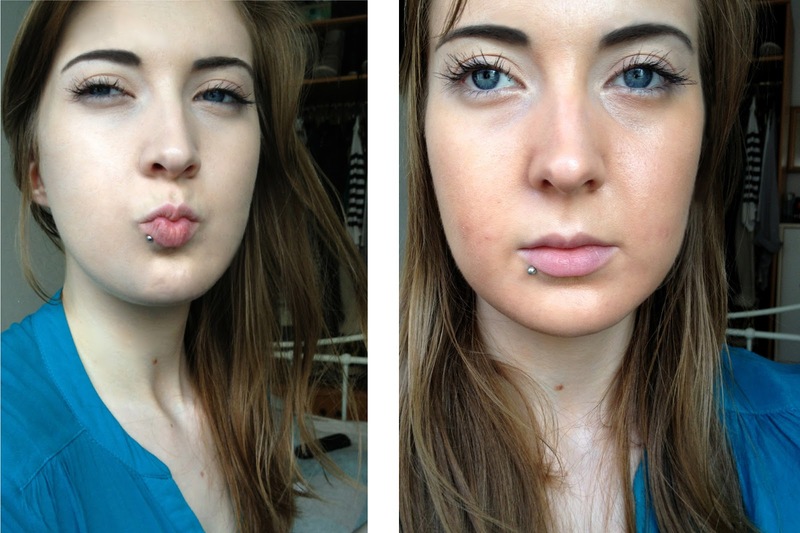 On the left is my natural skin colour without fake tan, I'm wearing Touch in SOL Pure Dew Water Drop BB Cream* (the best match for my neck when I'm this light), on the right I'm wearing the Clarins BB Cream in Light. Now to be fair I'm not usually this pale, I think my skin does look lighter in photos than real life, but it does really show just how not 'light' the shade of this BB Cream is. 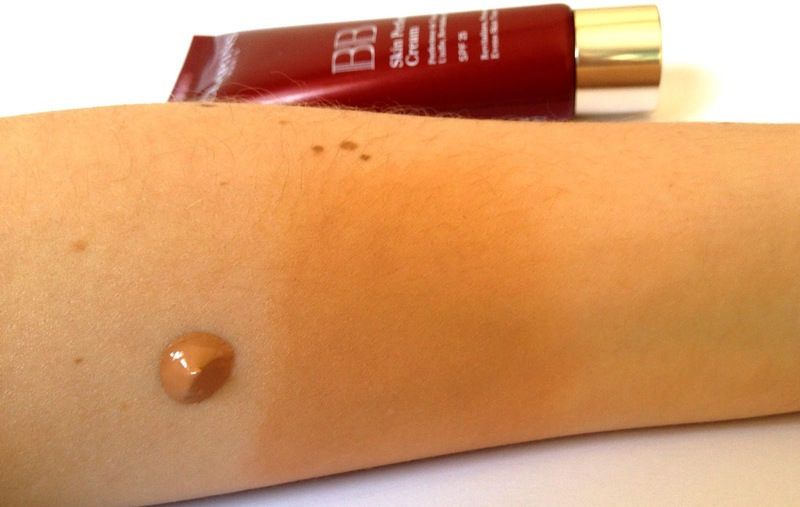 I've included a fake tanned arm swatch further below. Not looking too happy about it am I? This BB Cream also doesn't have the coverage that I was expecting- as you can see above my skin doesn't look 'smooth' 'even' or 'blemish free' as Clarins promises, and to me it still looks a bit blotchy especially on the right cheek (my left) which for some reason is always more of a problem. I took this in front of the window and the shininess isn't very flattering for my pores along with the fact that it looks like I've used the wrong type of highlighter under my eyes. I couldn't tell you the wear time for this BB Cream as I haven't properly worn it out of the house to judge but I have noticed my T Zone getting shiny quite quickly. Overall unfortunately a big thumbs down from me, I really wanted to like this BB Cream given its more detailed benefits over lots of the other BB Creams being launched here and the fact that it is quite expensive, but the darkness of colour was really the main deal breaker. Even on my tanned arm above it looks dark and orangey. Lots of people (probably with darker skin) do love this cream so I have no doubt in saying it isn't a bad product, it's just not for me. A lady tried some of this on me at an event the other day and it looked HORRIBLE, patchy and orange on me and it really put me right off! Oh no, it's so orange! What a waste! I can't find any BB creams that does are not greasy, or if they aren't greasy then they are just orange and patchy - not good.